One of the things stashed in our freezer is an overabundance of tomatillo sauce. Years ago, I happened on an amazing recipe for roasted tomatillo sauce. We usually grow a six-pack of tomatillos each summer. One six-pack yields many pounds of tomatillos. The resulting sauce freezes indefinitely. Believe me, I’ve testing the timing. In fact, this past summer, we opted not to grow any tomatillos to try to get ahead of the freezer stash. I’m always on the lookout for recipes that call for a Mexican salsa verde. Sometimes, I just make up combinations or substitute salsa verde for salsa roja. This recipe for turkey enchiladas originally came from my friend April. Her recipe has a smooth smoky red sauce and is quite tasty. This week, trying to use more of my turkey leftovers, I went for this recipe. I changed the sauce, substituting my tomatillo sauce, creating a completely different dish. Ole! For the filling, combine the turkey, grated cheese, and sour cream in a large bowl. Wrap the tortillas in a dish towel. Microwave for 30 seconds, or until the tortillas are soft and pliable, but don’t overdo it. 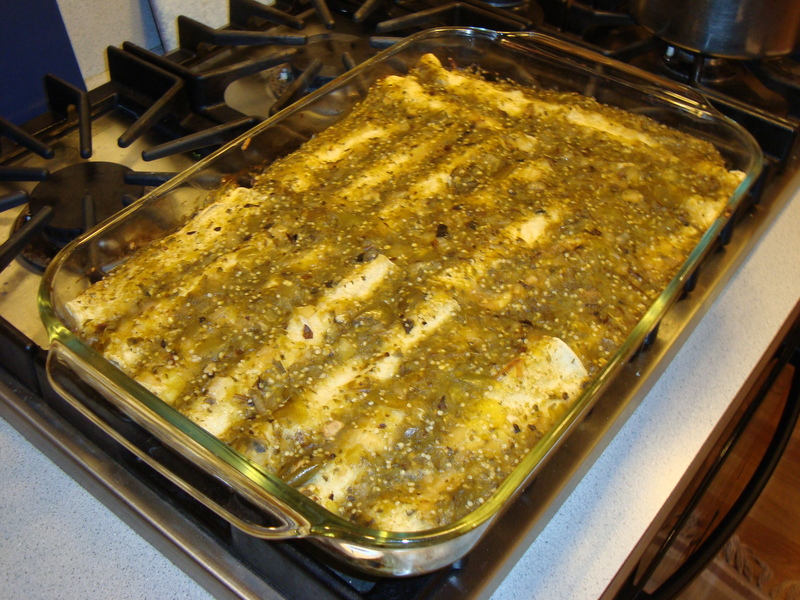 In a large baking pan (about 13×9), spread about 1 cup of tomatillo sauce to lightly cover the bottom of the pan. Spoon two heaping tablespoons of filling in the center of a tortilla. Roll it up, and place in the baking pan, seam side down. Repeat until you use up all the filling. You will fill at least 12, but possibly more, tortillas, depending on how generous you are with the filling. Pour the remaining tomatillo sauce over the enchiladas. Bake for 30 minutes until the sauce is bubbly. As with many recipes, I typically use less meat and more vegetables. We had so much turkey left over that I did use the originally called for quantity of turkey this time. Usually, I use half the turkey and a can of sliced black olives. You could use any kind of cooked salsa for infinite variety. This recipe multiplies easily. In the summer, I make several batches with 10 pounds of tomatillos at a time. The following recipe is for a more manageable amount. Move the oven rack to the top shelf. Preheat the broiler. Peel the tomatillos. If the skin is sticking, soak in warm water for a few minutes first. Rinse well with warm water to get rid of the soapy residue on the skin of the tomatillos. Place the tomatillos and jalapeno halves on a large baking sheet. Broil the tomatillos until the skin starts to blister, about 10 minutes. Turn everything over and broil the other side another 8-10 minutes. Set aside. Place the onion slices in one layer on a baking sheet. Scatter the garlic cloves on the same pan. Broil until the edges of the onions start to blacken, about 5 minutes. Turn everything over. Broil the other side until the edges of the onions start to black, another 5 minutes or so. Set aside. Place the onions, garlic, and jalapeno in the food processor. Pulse until everything is finely chopped. Place in a large bowl. Now, coarsely chop the tomatillos (along with any juices in the pan) in the food processor. Do this in batches if necessary. Add the tomatillos to the bowl with the other mixture. Stir the tomatillos and onion mixture together. If it seems too thick (which for me, it usually is not), add some water to get the consistency you think is right. Add chopped cilantro. Add sugar and salt. Taste and adjust seasonings. As I said, this freezes well.